For surfaces, including: sidewalls, decks, fencing, shake roofs, logs, and dimensional lumber. Exterior wood cleaner that rejuvenates wood to its original rich warm color by removing years of fungus growth, dead wood cells, lignin, dirt and discoloration. Biodegradable, non-corrosive and will not dissolve the cellulose in wood. COVERAGE: 150 to 250 sq. ft./gal. * CONCENTRATE: 1 gallon makes 5 ready-to-use gallons. X-180 Weathered Wood Restorer™ was developed because exterior wood surfaces, including decks and shake roofs, become discolored from dirt and general weathering. 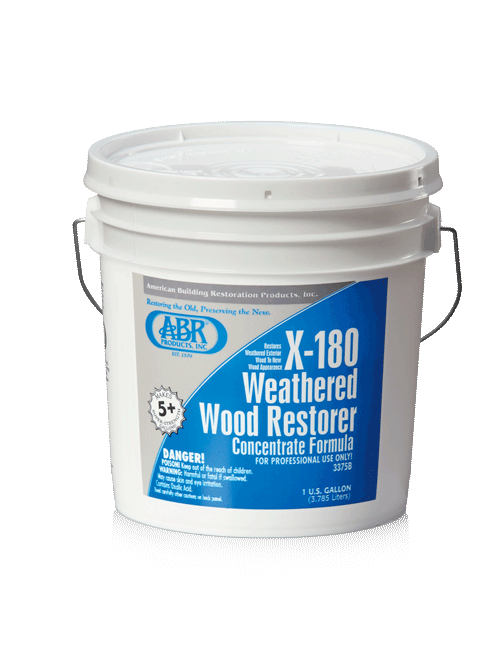 X-180 Weathered Wood Restorer™ counteracts the weathering process by eliminating years of fungus and discoloration from cedar, redwood, and other types of wood. It cleans and restores wood surfaces back to the appearance of new lumber. Using high pressure water alone to clean wood will create damage to wood fibers as well as, uneven stop and start marks. Water alone will not remove the fungus growth in the fibers. CAUTION: Household bleaching solutions (namely Sodium Hypochlorite) harm the environment, and will not produce a new natural wood color. Using bleach to clean wood may produce a chemical reaction to the outer wood fiber forming a film, causing future adherence and penetration of stains and paints to fail and separate. X-180 Weathered Wood Restorer™ is a biodegradable blend of oxalic and inorganic acids combined with a nonionic surfactant. The X-100 Natural Seal® family of products locks in years of defense against environmental damage and decay, maintaining the natural beauty of wood surfaces. 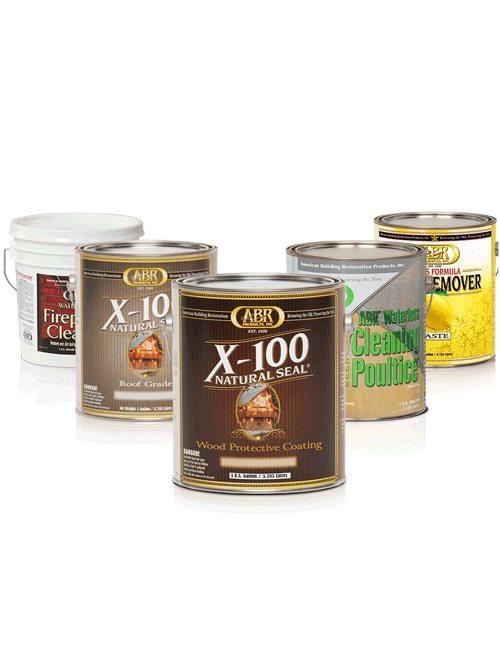 Each blend of X-100 Natural Seal® combines high-performance wood protectants with a targeted application base. The distinguishing formulas of X-100 Natural Seal® make it the most effective wood coating available for decks, roofs, siding, fences, and more. View our guide below to see which X-100 Natural Seal® product best suits your application needs. We are a manufacturer of specialty building restoration and preservation products, with over 47 years of experience. Restoring the old, preserving the new. Made in America.